I’ve built the Makerbuino. The initial tests checked out OK, and when soldering was complete the system starts up and performs setup tasks. The buttons all work etc. The step to flash from SD card is not working. Pressing C in the step to flash from SD is failing… Instead of doing something for 30s or so it shows ‘Flashing’ then reverts to the previous screen. This is the same behaviour as if I try with no SD card plugged in, so I guess that the problem is that the SD slot is not correctly soldered. I’ve tested with a multimeter for continuity, but struggled to match the pin numbers from the circuit diagram with those on the SD card slot. The pin numbers from the ATMEGA are clear enough as theyre labelled on the PCB. Counting pins up from the SD card notch to the tiny 3 unused pins gives 8 pins. I’ve called pin 8 the one closes to those 3 unused ones. ATMEGA pins 16 is shows connected to SD 5 and 4; pin 17 to 5; pin 18 to 5 and 7; pin 19 to 5. This suggests that I’ve managed somehow to make a mess of the soldering for the SD card. What can you advise? Desolder the SD card slot and clean it up? Can you advise on how to identify the pin numbers on the SD card slot as that would help with testing for continuity correctly? @William_Whittle, thank you for supporting MAKERbuino. I think that you’re overthinking this as it sounds like a simple contact issue. 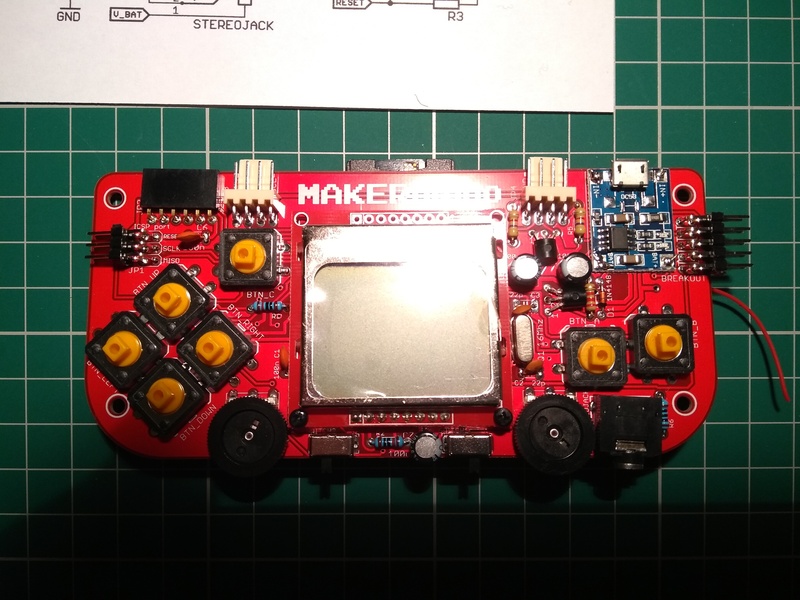 if nothing happens, please send me a couple of photos of your MAKERbuino’s front and back side with the casing and the screen removed. I’ve tried as you suggest, but it’s still the same. Here’s the back. To get a photo of the front with no screen will take more time as I’ll need to desolder the screen connectors. Also, your soldering joints seem to lack some more heat. Take your soldering iron and reheat the soldering joints on the SD card socket once more and try again. Here’s the picture of the screen side. I tried as you said to reheat those joints again, but it’s behaving exactly the same. @William_Whittle, can you please send us a photo of your revised soldering work? If the SD socket’s soldering joints are not causing the problem, you most likely need to reheat the joints on your microcontroller’s socket (underneath the screen). Removing the screen can be tricky and I’d suggest you send us the MAKERbuino so that we can repair it if you do not manage to make it work. I had exactly the same problem. I `ve checked all solderings, removed display again, resoldered chip socket. Then I tried it with an other MicroSD to SD Adapter - it works! So give it a try, use an other card adapter. @Dan, thank you for your advice here. This is quite strange as we test every single SD card and SD adapter before shipping them to customers. I am sorry that you had to deal with a defective SD adapter, shall we send you a new one? @William_Whittle, any news here? 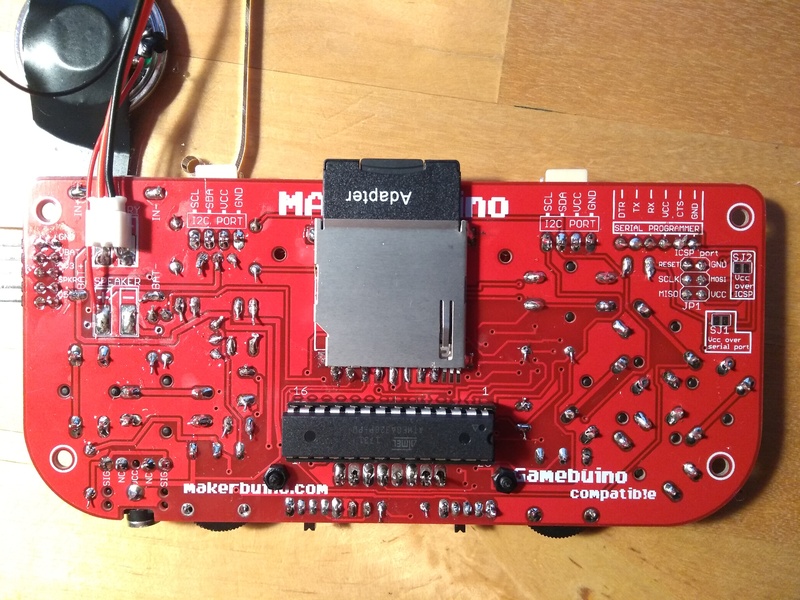 Did you mange to make your MAKERbuino work in the meantime? @albertgajsak, theres no need to send me a new adapter, I have enough. Strange thing is your adapter is working with my Mac, but not with Makerbuino - so its not completly defect. @Brady, thank you for supporting makerbuino and I am sorry for the problems that you’re experiencing. This sounds like a connection problem possibly caused by bad soldering joints. Please, create a new topic for your issue and give us some photos of your device’s front and back side.